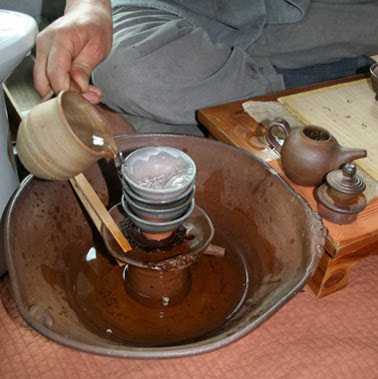 The way a tea ware artist decides to handle water is an important part of their production. Park jong Il uses several systems. This water tray is usually used for tea cups ch'at-chan and the serving of infused tea. It is a simple servant, unglazed except for the fly ash that might settle on it during the firing. 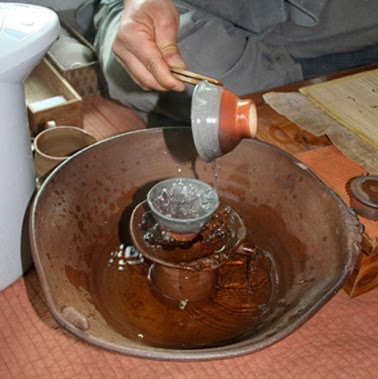 It is composed of two parts the 'bowl' that they call da-hae or 'tea sea' often referred to in English as an 'ocean' and the da-sun or 'tea boat'. 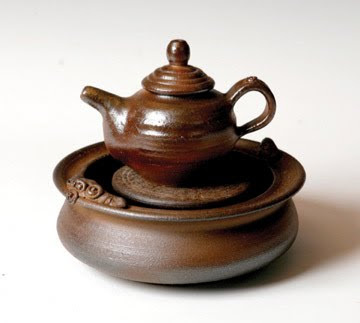 Traditionally with unglazed teapots one not only washes the cups on the da-sun but also pours hot water over the unglazed teapot during the brewing process and the excess water collects in the da-hae. The teapot ch'akwan or ch'at-chonja is unglazed except for the fly ash as well. Park's da-hae system is simple and direct. The teapot and tea cups are accompanied with a tea cooling bowl mulshikim sabal, a stand for the lid of the tea pot and a tea scoop or chasi. Most often tea scoops are made from bamboo. 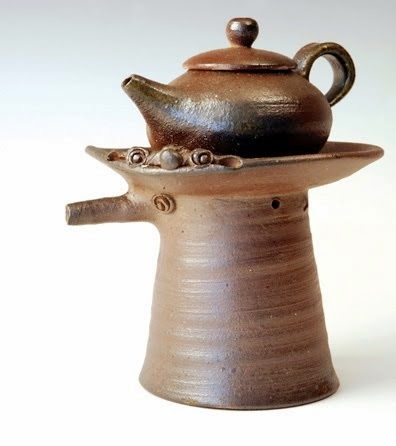 We seldom find a tea ware artist that makes his own tea scoops. I first mistook his ceramic tea scoop for a tong rest. Tongs are used to pick up teacups for washing and heating. 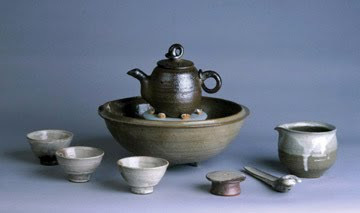 A third water system is a 'water tray' also known as a gee myun da-hae here seen with a teapot and cups, a tea caddy, hot water ewer, cooling pitcher and small brazier. Each piece is natural, humble and a true servant to tea. I have not seen any other potter use a tall water tower that is a version of a da-hae like Jong Il's. It is called a kkokkiri da-sun or trunk/nose da-sun. Usually placed in a bowl it is is used both for washing a number of bowls and a number of cups stacked inside each other. The hot water on the cups heats them, a common practice. Park Jong Il's work is particularly prized by Seon Zen monks and tea masters who look for the natural. 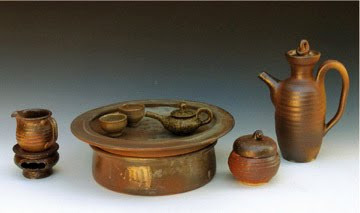 Many Korean artists believe that tea ware should be simple because in essence the purpose of tea ware is to serve. They should have personality but not be too proud or boisterous. They should invoke a quiet sensitive state of mind. The tea ware should not overpower the tea. The work should be natural because all the contrivances we can come up with to “enhance” tea ware pale in comparison to what happens naturally in a simple wood or even gas firing. It is easy to create flamboyant, whimsical or outlandish work we call tea ware. Far more difficult is creating tea wares that truly serve. More importantly, Park Jong Il's work is directly connected to his life. In part that is why I selected Park Jong Il to introduce first. The life and work of a good Korean potter are one. In a previous post I quoted Hamada and it seems appropriate to do it once more. Hamada Shoji said, “I think there are hardly any pots in the world through which a people’s life breathes more directly as Korean ones, especially Yi Dynasty wares.”(1) It is clear that Park Jong Il embodies that same spirit. (1) From Hamada Potter by Bernard Leach.